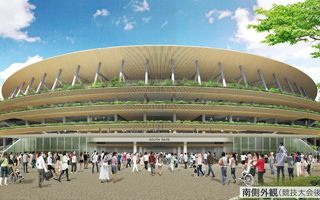 Earlier today Prime Minister Shinzo Abe announced the selection of Kengo Kuma’s design for new national stadium in Tokyo. The so called “Option A” already has a nickname of the hamburger stadium, which might not sound too great, but the below rendering is what earned it. The stadium’s organic feel will be created by large use of wood in cladding and trees/hedges replacing a more opaque façade. The vision was favoured over “scrambled egg” (are these ever serious?) “Option B” by Toyo Ito. Today’s decision doesn’t mean immediate works on the abandoned site, because so far architects only had 14 weeks to deliver their bids. Now several months are required to develop the final concept of the stadium and construction should begin in early 2017. The redesigned stadium should cost ¥ 153 billion ($1.26 bn / €1.16 bn) and will be delivered by Taisei Corporation by the end of 2019.